What is a Silver Boxer? 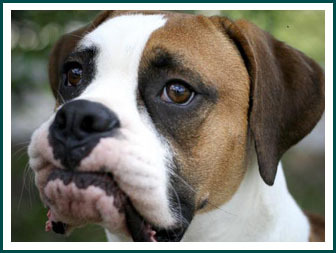 Boxers over the age of 7 are referred to as “Silver” Boxers because of the silver or gray hair that often appears on their muzzles and the rest of their bodies. Silver Boxers are very majestic and beautiful. Many Boxers over the age of 7 end up in shelters or rescue programs, because their owners choose to no longer care for them or would rather have that new, cute puppy. These dogs don’t have much of a chance at adoption–competing against younger, rambunctious Boxers, who don’t have a gray hair to be found!! Remember, these dogs were once young too, and now they need help retaining their dignity in their old age! 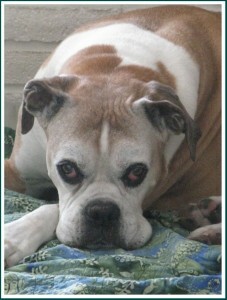 Silver Boxers deserve to live out their lives with families who care about them. With today’s medical advances, Boxers can live past their life expectancy of 10-12 years! If you are an individual who doesn’t care to go through puppy proofing your house and the potty training bit–consider an older Boxer. They are calm, loving, and quiet. They deserve a family to love, and who will love them in return. 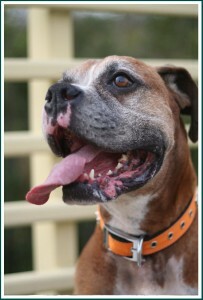 Consider adopting an older adult Boxer, and show him he was worth saving. If you wish to read a lovely tribute to a very special Boxer boy by the name of Bo, please read My Best Friend Adopted Me. Benefits of sharing your life with an adult Boxer. Older Boxers are usually potty trained! Adult Boxers are more calm and well-mannered than their adolescent counterparts! They still enjoy play and need exercise on a daily basis, but lack the “Energizer Bunny” energy of a younger dog. With an older Boxer, there is no guesswork involved with what they will look like or act like as an adult Boxer, because they already are adults! 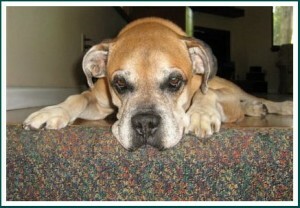 Older Boxers seldom will “chew” as they are past the teething stage. Many will not even jump up on people and are perfectly content to be a couch potato. They are also extremely appreciative of love and attention; and seem to be grateful for the opportunity of adoption. You can’t teach an old dog new tricks…right? Wrong! The old saying, “you can’t teach an old dog new tricks” is completely untrue, especially when you’re talking about a Boxer! Many people erroneously think older dogs are “set in their ways” and that the new guardian would not be able to train or “break habits.” This is false. The Boxer dog LOVES his human, and aims to please! They are loyal dogs who will knock themselves out to please and make their humans happy. 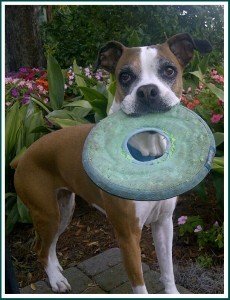 A few kind words and a pat, hug or kiss, and that Boxer will jump through hoops for you! If you have an older pet please be responsible and keep that family member for his entire life, even when his health starts to deteriorate. Remember, you will be old someday too. Wouldn’t you want your family to give you the respect and dignity that you’ll deserve in your golden years? Show that same respect to your pet and repay his lifetime of loyalty to you, by standing by his side in his old age.